Windows 10’s Fall Creators Update gives you more control of Windows Update’s downloads and uploads. 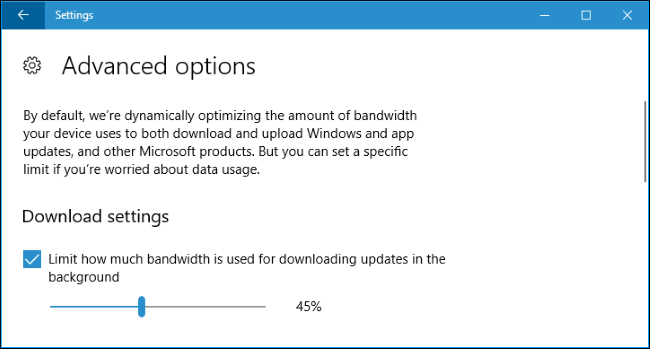 You can now set a download bandwidth limit, ensuring Windows Update won’t hog your Internet connection with its background downloads. The Settings app also gives you more control of Windows Update’s background uploads and keeps track of how much data Windows Update has downloaded and uploaded. 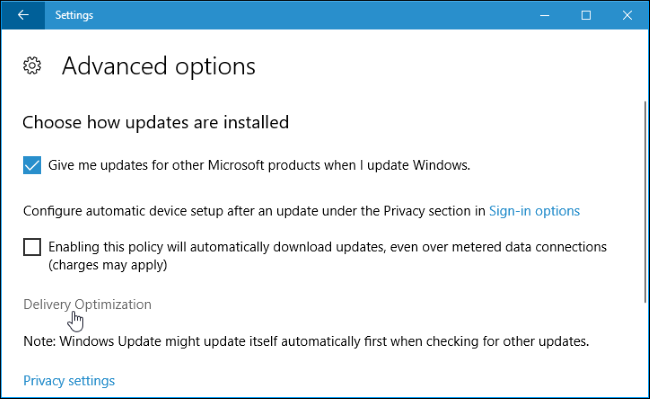 This setting also applies to app updates from the Store and updates for other Microsoft products, not just Windows updates. 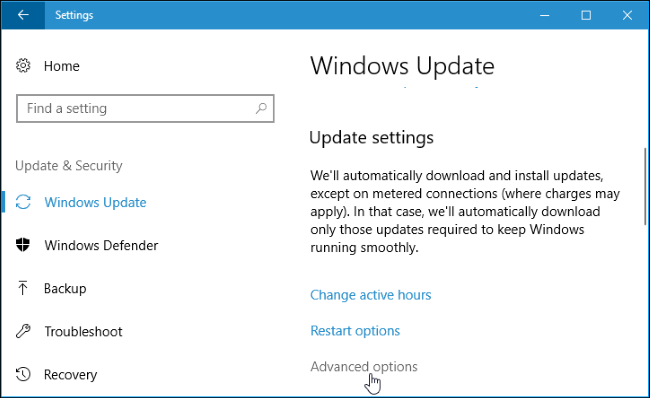 To find this setting, head to Settings > Update & Security > Windows Update. Click “Advanced Options” under Update Settings. Click the “Delivery Optimization” link on the Advanced options page. Click the “Advanced Options” button here. Activate the “Limit how much bandwidth is used for downloading updates in the background” and drag the slider to set a limit as a percentage of your total available bandwidth. As this window notes, Windows Update won’t try to use all your bandwidth by default. 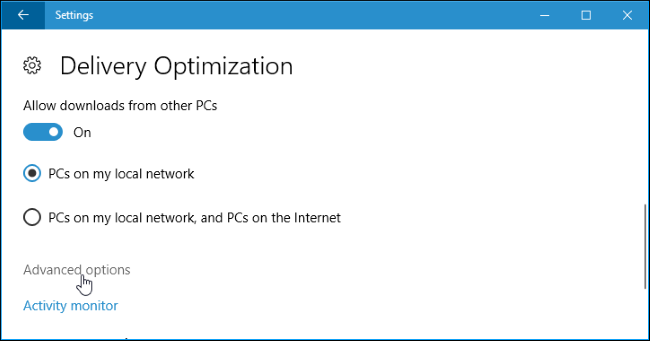 Instead, Windows Update tries to “dynamically optimize” the amount of bandwidth it uses. 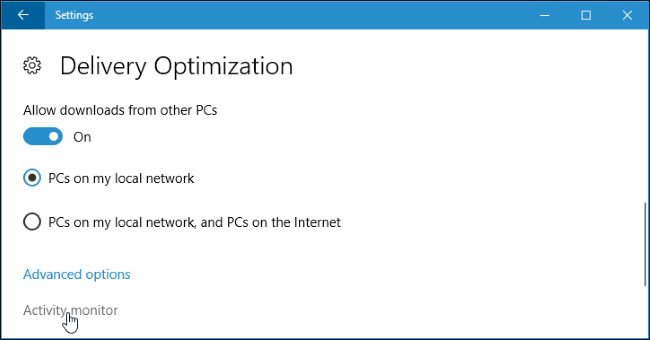 But this option allows you to ensure Windows Update won’t go above a certain percentage of your available bandwidth, no matter what. 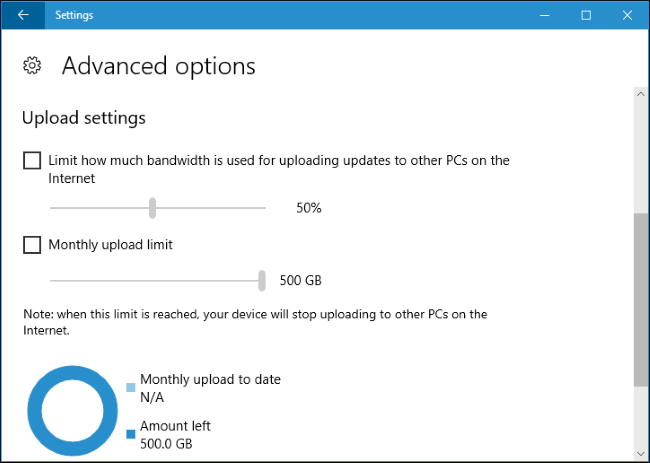 You can also limit the upload bandwidth used by Windows Update. Windows Update normally uploads copies of updates to other PCs—either just your PCs on your local network or PCs on your local network and on the Internet, depending on what you choose on the “Delivery Optimization” screen. The sliders here allow you to choose how much bandwidth is used to upload updates to other PCs on the Internet and set a monthly upload limit, which is the maximum amount of data your PC uploads. We think there’s no good reason to even have the Internet upload feature enabled in the first place, especially when more Internet service providers are enforcing data usage limits. Let other PCs download updates from Microsoft’s servers so Microsoft can pay for the data. You can still leave the “PCs on my local network” option enabled to have your PCs share the downloaded data among themselves, speeding up your updates and saving you download bandwidth. 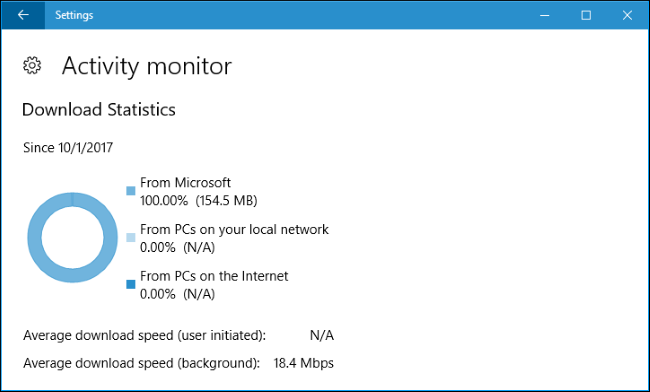 To view more information about how much data Windows Update has downloaded and uploaded, click the “Activity monitor” link on the Delivery Optimization page. This page shows you download and upload statistics, including how much data has been downloaded in the background and your average download speed. You can also see how much data you’ve downloaded from Microsoft, from PCs on your local network, and from PCs on the Internet. This includes Windows Update updates, Store app updates, and even updates to other Microsoft products on your system. 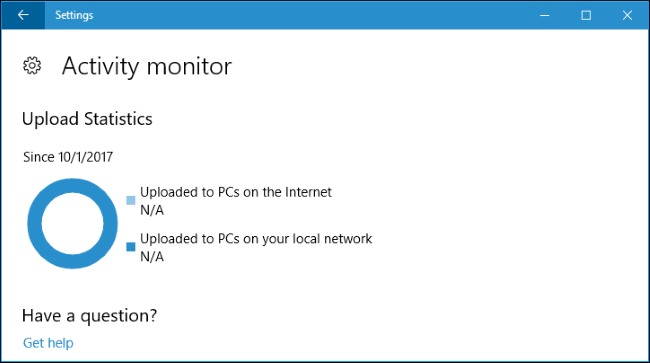 Scroll down and you can also see how much data Windows Update has uploaded to both other PCs on the Internet and PCs on your local network.